It’s been reported earlier that a biopic, titled Chandrodayam, on the life of Andhra Pradesh Chief Minister Nara Chandrababu Naidu is in the works. The film will showcase Chandrababu’s inspirational life journey from his humble background till his rise as the Chief Minister. 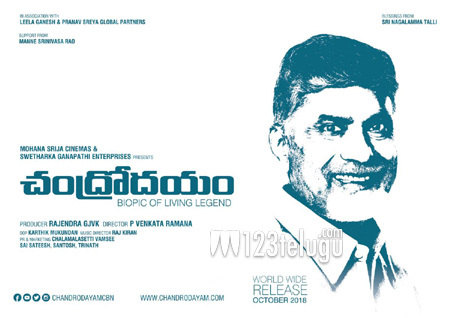 Today, on the 23rd anniversary of Chandrababu’s journey as AP CM, Chandrodayam’s makers unveiled the film’s first look poster. The team also announced that the movie will be hitting theaters in October. Rajendra GJVK is producing the movie. Chandrodayam has an all new cast. Debutant Venkata Ramana is the film’s director. Incidentally, NTR and Yatra, the biopics on former Chief Ministers of erstwhile Andhra Pradesh NT Rama Rao and YS Rajasekhara Reddy, are scheduled for release for Sankranthi early next year. But Chandrodayam sealed its release date much in advance.